RIVERSIDE – Whatever Cook County decides to do to bring about flood relief to Riverside Lawn, officials say no one will be forced to sell their property. According to county officials, claiming eminent domain is not an option. 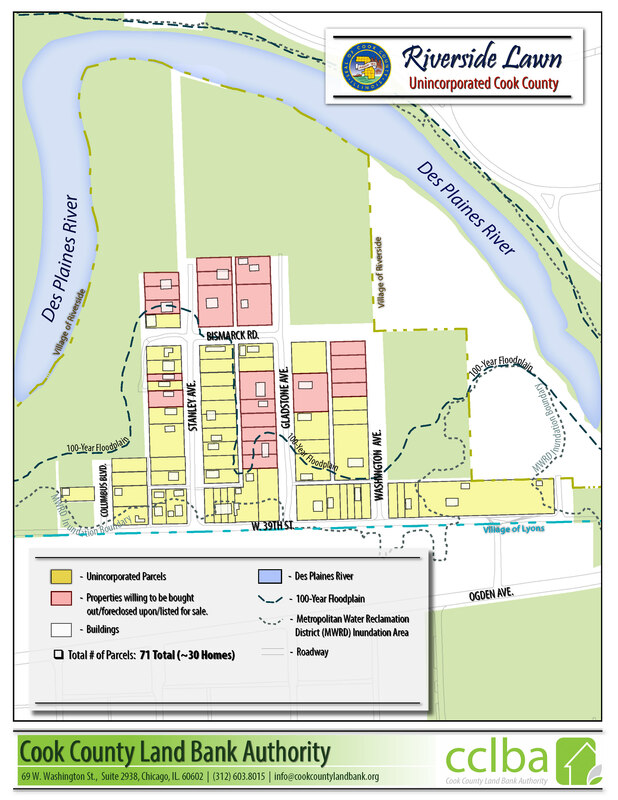 Officials from the county and the Metropolitan Water Reclamation District of Greater Chicago (MWRD) met Riverside Lawn residents July 30 in a public meeting to discuss how to bring relief to the flood-beleaguered residents in the unincorporated subdivision on the south bank of the Des Plaines River. Riverside Lawn lies huddled in a forested area between Lyons and Riverside on the banks of the Des Plaines River, which borders the area on three sides. 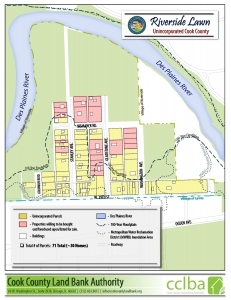 At the center to the discussion at the meeting July 30 was the county’s offer to purchase Riverside Lawn land parcels. The county said the homes would be razed and the land turned over to the Cook County Forest Preserve District to remain permanently green and undeveloped. There are approximately 71 parcels with 30 homes in the area, county officials said. Each property would be assessed at the pre-2013 flooding date by county assessors. Residents could independently get their property assessed, as well, and present their appraisal to the county for consideration. In the event a property owner and the county come to an impasse, an arbitrator would be called in, officials said of the process. Robert Rose, executive director of the Cook County Land Bank Authority, said a “critical mass”of willing property sellers is essential, and the parcels would need to be contiguous with each other before the county would entertain purchasing them. Simply put, the county would not make an offer to a hodgepodge of individual parcels within the flood plain of the subdivision. “If you decide as a community ‘No,’ it’s over in the truest sense of the word,” Rose told homeowners at the meeting. However, Jane Hornstein, deputy director for Community Development for Cook County, said the county would probably go ahead and purchase any property from a willing seller. Richard Fisher, senior civil engineer for Metropolitan Water Reclamation District, said the area was previously evaluated for the possibility of building a protective levy, but property issues created a roadblock to the plan. Cook County received $83.6 million in U.S. Department of Housing and Urban Development (HUD) funding in response to the disastrous flooding of 2013. Those funds are earmarked for flooding issues in Cook County only and cannot be used for any other purpose. Up to $9,236,410 is available to purchase the properties with both HUD funds and funds provided through the water reclamation district, Hornstein said. The crowd of about 200 people at the meeting appeared to be split in terms of those who were open to the purchase program and those who want to continue to call Riverside Lawn home. Diane Gryglak said she has lived in Riverside Lawn for 30 years and is almost an empty nester. Gryglak said she has weathered through numerous floods and has lost her share of washers, dryers and other items normally found in basements. For her part, she said she was ready to go. Gryglak added she believed that taking advantage of the buyout was probably the best thing she can do, considering the difficulty of selling a house in Riverside Lawn. With the publicity surrounding the flooding issue, it will soon get even harder, she said.